Riding a motorcycle can be one of life’s greatest pleasures. It gives you a liberating experience where you are in control of your own free will. You can go anywhere you want on a motorcycle which is a very satisfying feeling in itself. But one should understand that driving is not a right, but just a privilege. Therefore, safety is one of the major factors that has to be taken into account always. One must invest in safety equipment, and helmets are one of the most essential bike gears to have. This is mainly because a motorcycle does not provide the structural protection that a car does, so in case of a brain injury, it can prove to be fatal for the rider. But there are a plethora of options when it comes to helmets and it can get confusing to place your finger on one from a long list containing some of the best motorcycle helmets. This is why we have done your homework for you so we can help you choose a motorcycle helmet which would be the perfect fit for you. SHOW ME THE TOP 20 HELMETS NOW! Full Face Helmets – This helmet offers the greatest protection to the driver’s head and neck from any potential accidents. A distinguishing feature of this helmet is the chin bar, which is a key safety feature that is not present in other types of helmets. According to a recent study, the chin suffers 50% of the impact during an accident, and only a full face helmet can provide the protection you need for your chin and jaw. This helmet is an all-around choice for all riders, regardless of the type of motorcycle you ride or where you ride it. Most full face helmets have ventilation through the helmet which reduces the visor fogging, and also helps in the evaporation of sweat that keeps the driver cool while riding. During colder times, the ventilation can even be closed to reduce the airflow, preventing the driver from freezing because of the cold. Modular Helmets – Modular helmets are a mix between an open-face helmet and a full face helmet. The reason is that the chin bar and visor can flip up to open the front of the helmet. These helmets tend to weigh slightly more than the traditional full face helmets, owing to the extra design hinge features incorporated into the front area. The rider’s safety is slightly reduced because of the hinge as the chin bar is designed to sit lower on the face. Adventurous riders usually use the modular helmet. New features include Bluetooth speakers, a dual visor system and the anti-fogging coating on the primary visor. Open Face Helmets – These type of helmets cover the top, back, and sides of your head but leaves your face exposed. They are popular choices amongst people that ride on scooters, cruisers etc since the face area is kept open in order to feel the force of the wind against the skin. One of the most distinguishing features of an open helmet is the lack of a chin bar, which significantly decreases the safety associated with any motorcycle helmet as your face is left exposed. The weight of an open helmet is slightly less than that of the full face helmet mainly due to the absence of the chin bar. Unlike the full face helmet, the open face helmet is unable to protect you from harsh weather conditions and road debris, largely because of the open nature of the helmet. They either come equipped with partial or full face visors to protect the eyes and face from sunlight, though in some models you are required to purchase the parts separately. Half Helmets – These helmets cover only the top of your head and the area from your forehead to your eyebrows. Minimal protection is provided in half helmets as a lot of the face is exposed. Although the helmet provides great airflow, they offer significantly less protection than a full face or an open face helmet. You can still, though, find half-helmets on the market that are DOT approved. Most of the half helmets do not come equipped with a visor, so you need to purchase some sort of eye protection such as riding glasses or goggles. These are minimum requirements in order to shield your eyes from flying debris, dust etc. Half helmets also consist of technological features such as Bluetooth speakers with only enough space to equip them, thus restricting the helmet to just one feature at a time. This also narrows the potential to upgrade these helmets due to its various limitations. Off-Road (Dirtbike, Motocross, or MX) Helmets – Off-road helmets are manufactured for, just as their name suggests, riding away from the streets, and on dirt roads. This means they aren’t the best option for city or highway use but are perfect for places where bumpy tyres are a requirement. The design of off-road helmets is completely different from that of full and open face helmets. Off-road helmets come equipped with a larger visor with a more emphasized chin bar tailored for better airflow. They are typically designed to offer maximum protection, are of minimum weight, and the provide air ventilation, making riding a refreshing experience during the warmer months. Due to the terrain’s rugged nature , these helmets do not come equipped with comforts like Bluetooth speakers. Off-road helmets usually do not offer eye protection, so the rider should be prepared to purchase riding goggles to shield the eyes. Goggles are usually preferred while riding in muddy areas as they press against the rider’s face to prevent debris’ intrusion from the bottom and sides while riding. There are many composite options available, such as fiberglass, Kevlar, and carbon fiber that offer great strength and are also lightweight. This property ensures that the head and the neck do not become fatigued after a long day of riding. While purchasing eye goggles, you may also try them on just to be sure that they seal your face well. Some helmets are shaped differently around the eyes so they won’t fit all goggles perfectly. Dual-sport (Crossover, ADV, Hybrid, Enduro) Helmets – Dual sports helmets are a blend of an off-road helmet and a full face helmet. It has an exterior styling similar to that of an off-road helmet comprising of a large visor and a lower chin bar but offers more interior padding and comfort just like a full face helmet. Dual sports helmets are meant to be used both on the road and off-road. This type of helmet offers a larger eye protection visor than that of a full face, and can also snap into an upwards position to accommodate the eye goggles. The visor has an aerodynamic design, therefore, it does not lift in the wind like a true off-road helmet. The chin bar does not protrude as much as in an off-road helmet which accounts for better soundproofing and restricting the airflow. This helmet proves to be a great option when you want to mix different terrains on the same riding day. The visor can be kept in the down position while riding on the streets and on reaching the trail, the visor can be snapped up for the goggles and maximum airflow to kick in, that makes for a pretty exhilarating ride. Gone are the days when all the driver needed to do was select the helmet size, be content with their choice and ride away. With all the advancement in technology, the boundaries of safety have been pushed and a lot of information is needed while choosing the ideal motorcycle helmet. With numerous alternatives available in the market, there is no shortage of some of the best motorcycle helmets, which means you should have a brief idea about how these helmets compare amongst themselves. To make this easy for you, we have listed down some of the major factors to look out for so you can make the right choice. The Outer Shell – Usually made out of Kevlar or carbon fiber, the outer layer should be tough and rigid as it is the first thing that makes contact with the ground in an accident. A well-built outer shell will be able to offer more protection to your head, hence, it must be one of the important things you should look out for. Crushable Layer – It is a thick foam layer that lies directly underneath the outer shell in the helmet. The purpose of this layer is to absorb maximum impact which goes a long way in protecting your head and brain. The material used is Expanded Polystyrene (EPS) since it is light and crushes easily under pressure. Comfort Layer – As its name suggests, this layers makes the helmet snug and comfortable. This layer consists of foam pads that are in contact with the back of the head all the way till the neck. The foam should be strong enough since, under high wind pressure, your helmet may get pushed back and compress your nose. Thus, a good quality foam will make it comfortable for the driver to wear the helmets for long periods of time. The Chin Strap – This is what holds the motorcycle helmet in place and prevents it from falling so the chin strap should be sturdy. The chin strap is made from woven material and is fastened using two d-strings. This is one of the most basic but vital components in all helmets. Visor – The purpose of the visor is to keep all kinds of debris away from the eyes so the driver does not get distracted, which lowers the risk of a mishap. The visor should be chosen in a way such that the driver can see the road clearly even in low light conditions. Helmet Weight – The weight of a typical helmet is usually in the range of 1400 to 1800 grams. It is important for the helmet to fit properly as to evenly distribute the weight around the head and shoulders. Even a slight shift in the center of gravity can put a strain on your neck which is harmful and should be avoided. Additional Features – With improvement in technology, there have been some innovative additions to the designs of motorcycle helmets. Bluetooth technology is one such feature which enables the driver to answer phone calls easily while riding. This gives the driver peace of mind, and also decreases the risk of accidents. Price – This will always be one of the vital factors affecting a customer’s choice since they will want to get the best motorcycle helmet for their money. Looking only at the price and making the decision is not recommended as other major factors dealing with safety are also involved. We will delve deeper into this later on. Warranty – Nowadays, most helmets come with a warranty. This can be a good addition which ultimately increases the overall value of the helmet. If something happens out of the ordinary, you will be protected by the warranty which saves you from incurring larger costs. Color – Though not the factor that comes to everyone’s mind first, light-colored helmets are more preferable since they are easy to spot for other drivers on the road. 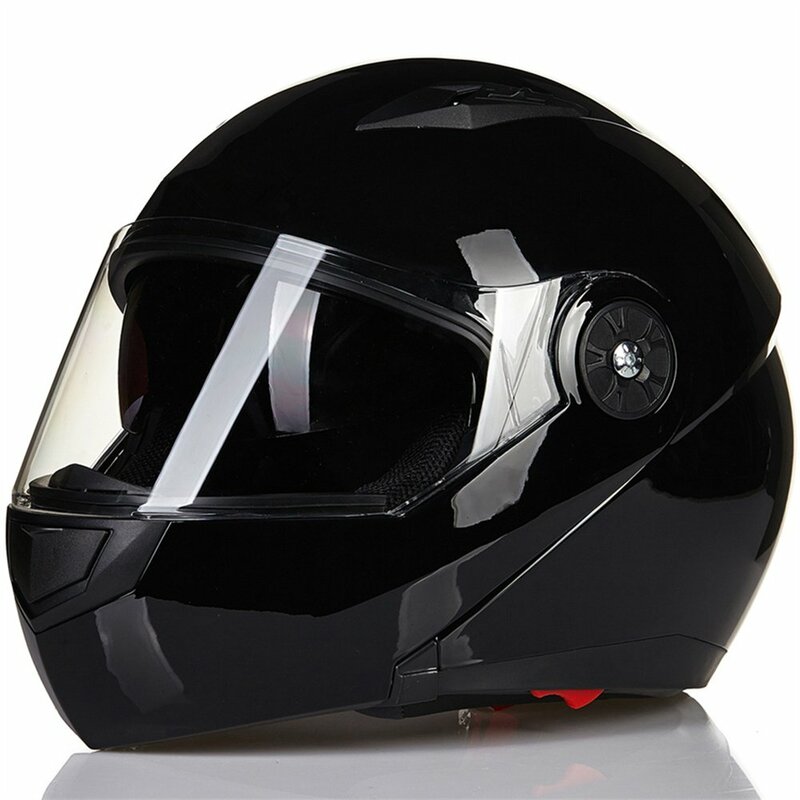 This not only reduces the risk of accidents but also gives you the pleasant feeling of owning one of the best looking motorcycle helmets out there. Many of us crave a stylish helmet that would be the perfect companion to our bike when we take it out for a spin. Let’s accept it though, even though we know that helmets are crucial for our safety, we tend to leave it behind because the ‘safest’ helmets tend to be bulky and boring. You don’t need to worry any longer because GDM, considered one of the pioneers when it comes to manufacturing safe and stylish helmets, often comes up with the goods. GDM treats the safety of the rider with utmost priority with extensive research dedicated to each product in development. This ensures that you only get top-notch products. This is why GDM Duke Helmets is at the very top of our best motorcycle helmet brands list and is the perfect fit for many riders. 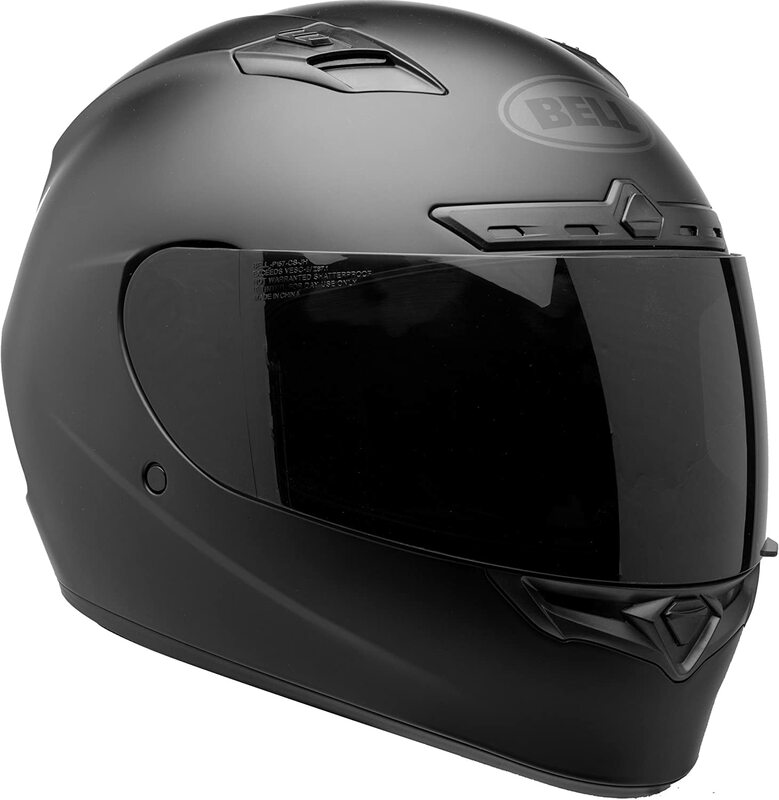 Bell Helmets are manufactured by Bell Motors who are considered experts in what they do. Bell Motors were the ones who designed the very first full face helmet all the way back in 1971! These helmets are not only stylish but are highly functional as well, backed up by the fact that they are worn by top motocross racers like Josh Herrin & James Stewart. The most fascinating thing about Bell is that they put great detail into the helmet design. They are also extremely comfortable on the head. Arai is a really old company that was founded way back in 1926. It is a Japanese company that manufactures some of the best motorcycle helmets around the globe. The best thing about these helmets is that they are all hand built. Each and every helmet is tested thrice – once after the shell of the helmet is made, the second time after the helmet is painted and thirdly after the assembly. Arai helmets are said to always meet or exceed the Snell Memorial Foundation safety ratings which are very affirming for the rider in terms of their safety. Several prominent MotoGP racers including Dani Pedrosa & Nicky Hayden are users of Arai helmets. Getting the know-how about the top motorcycle helmet brands goes a long way in helping you decide which helmet is the best fit for you. There will be brands claiming to manufacturing the best motorcycle helmets, and they may all look very appealing too but the ones manufactured by the top brands are those that get the closest to guaranteeing your safety as well as lasting for a long time. It is recommended that if you are looking to buy your motorcycle gear then it should be someplace that has a great variety of options available. This ensures that you get the helmet that is the perfect fit for you. Out of many options, we have come to the conclusion that Amazon are the perfect candidates where you can purchase some quality motorcycle headgear. 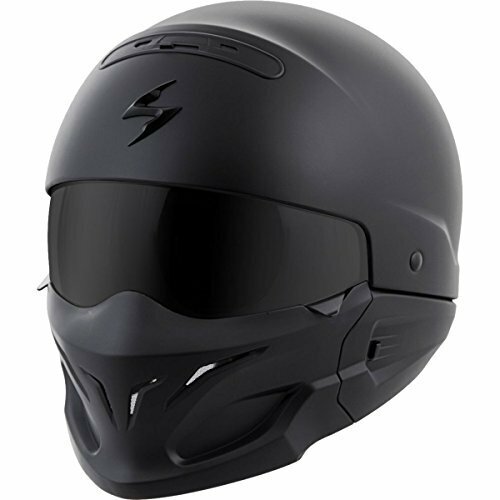 They have a very generous return day policy, a broad range of products and reasonable pricing which makes them the best place to buy motorcycle helmets. Can you find a helmet that is not only super-safe but also comfortable at an affordable price? Yes, you can and the Bell Qualifier full-face motorcycle helmet is proof. This helmet is packed with a ton of features including the likes of NaturaFog II, anti-fog and anti-scratch UV-protected shield and padded chin strap with D-ring closure. The padded wind collar significantly reduces wind and road noise. The shell itself is lightweight polycarbonate/ABS, meaning it’s strong and durable, able to withstand some serious impact. Provision of a click-release shield makes the shield replacement fast, easy and tool-free. There are also contoured cheek pads that provide maximum comfort. The entire comfort liner is removable and washable, with integrated speaker pockets making it all the better. This DOT certified helmet comes with a 5-year warranty and is priced just under $110 which makes it quite appealing. This modular full-face helmet by 1Storm consists of an advanced Flip up and Dual Lens design which comes in a wide range of colors. Priced just under $60, this helmet is affordable too. It has been designed beautifully with the finishing as elegant as you will see. Its aerodynamic thermoplastic shell makes it look rich and is also capable of withstanding impact. Being light in weight makes it comfortable for the rider. The visor of the helmet is designed in an excellent manner as it gives the helmet a distinctive appeal, making it look stylish. Apart from this, it also has a UV protective finish, which provides the eyes with the protection that it needs from the harsh heat of the sun. The easily removable and washable padding not only makes it convenient to maintain the quality of the helmet (prevents bacterial growth) but also provides the cushioning that your face needs. Located in Los Angeles, United States, Duke Helmets has been producing some high-quality motorcycle headgear that has proven to excel in areas of style and comfort. This brand prides itself in making great products with the highest safety ratings possible. When you choose the DK-120 full face helmet, you can assure yourself that you are buying into a safe, reliable and a high-quality full face helmet. This helmet was constructed and manufactured using strict safety guidelines so it meets the DOT FMVSS-218 safety standards. The DK-120 helmet has great visual looks too. 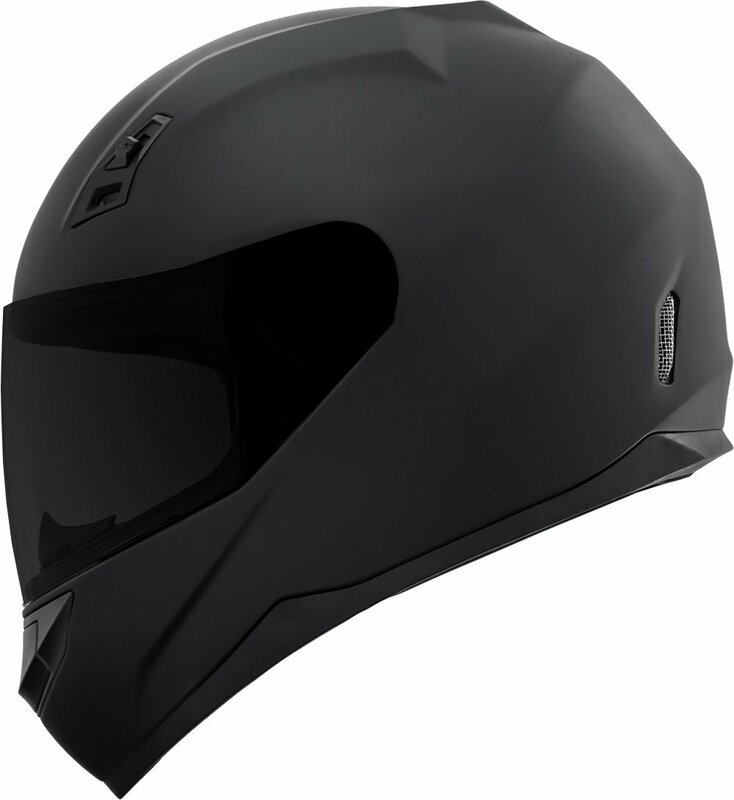 With its sleek lines, dark black color and the aerodynamic shell design, the DK-120 helmet looks fabulous. You won’t complain about neck problems due to the usage of an advanced lightweight composite poly-alloy. This DOT certified DK-120 Helmet highlights the level of comfort one can enjoy, courtesy of liner cheek pads which are made from hypoallergenic and antimicrobial nylon. They are also removable so you can wash and reinstall them anytime you want to. With its Flush-fit, the side-coverless face shield is optically correct and also has compound curves which are scratch resistant and protect the motorist from dangerous UV-rays. There are 7 different points of ventilation vents situated on the chin, rear, and forehead which always ensure great air flow. The ILM 8 Colors motorcycle helmet comes equipped with a lot of features. It is DOT certified, with the helmet meeting the expected safety standards. The advanced lightweight ABS Shell comes with the EPS Impact Absorption Inner Liner which is a big plus point for any helmet in terms of keeping the rider protected in the event of any mishap. ILM aims to provide durable helmets so the user can use it to its full extent. The liner/cheek pads that come with the helmet are easily removable and washable which makes it convenient in taking care of the helmet. As it comes in 8 colors it gives the customer a wide range of choices. It also consists of a modular flip-up function, anti-scratch, anti-fog and a wide view clear visor which helps to keep the rider’s focus on the road. With a sleek and lightweight design, that reduces wind noise, the ILM 8 Colors helmet has almost all the fields covered. Well, almost. After analyzing some customer reviews, it has come to light that the helmet is considered ‘too’ lightweight to fulfill its protecting duty, with very thin padding adding a flimsy feel to it. This has done the helmet no favors and customers have switched over to better alternatives on the market. 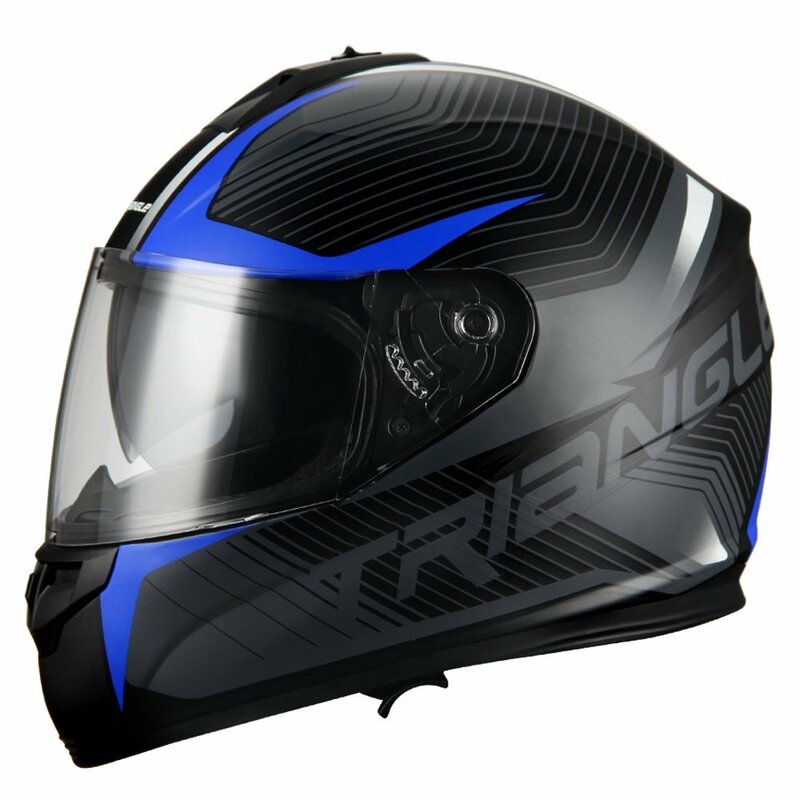 This low budget DOT certified motorcycle helmet by Triangle, adds a hint of style to your motorcycle collection. 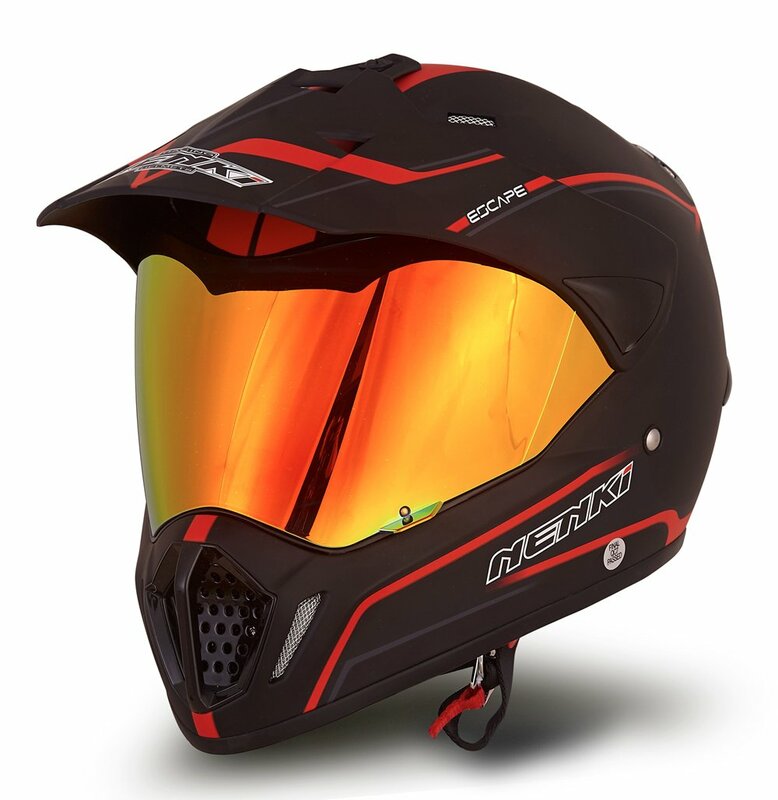 This full face helmet comes in 4 amazing colors that are bound to catch everyone’s eye. The advanced ABS outer shell consists of high-quality thermoplastic technology that can resist big impacts, thus keeping the head safe. This is important as the cause of many fatalities has been damage to the brain. In addition to a sturdy outer shell, the inside is made of multi-density EPS lining which brings comfort to the rider, especially useful during long rides. In addition to this, the soft laser cut padding offers dry comfort with the option of hygienic treatment which proves to be very helpful in taking care of the helmet. 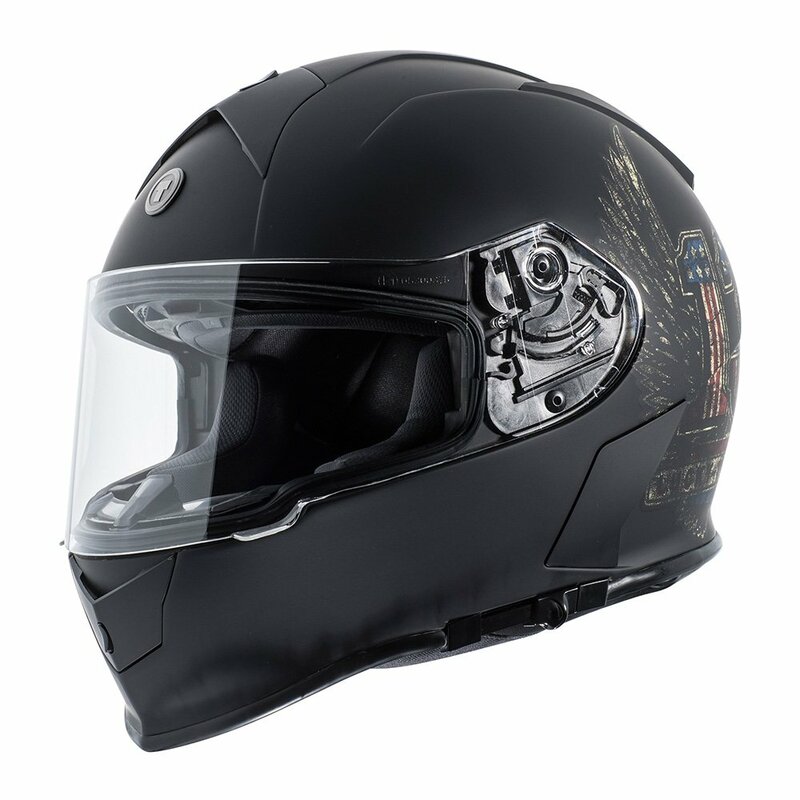 The double PC anti-scratch visor and removable DVS treatment come with a quick change mechanism system that makes it really easy for the motorcyclist to maintain the helmet. For great airflow, the ventilation systems are installed both in the front and the rear so during long rides, the air doesn’t feel stale. There is also a padded chin strap with micrometric closure which helps in fastening the helmet tightly on your head. It has a sun visor. The ILM Bluetooth Integrated motorcycle helmet is a combination of protection and comfort on one side and modern technology on the other. 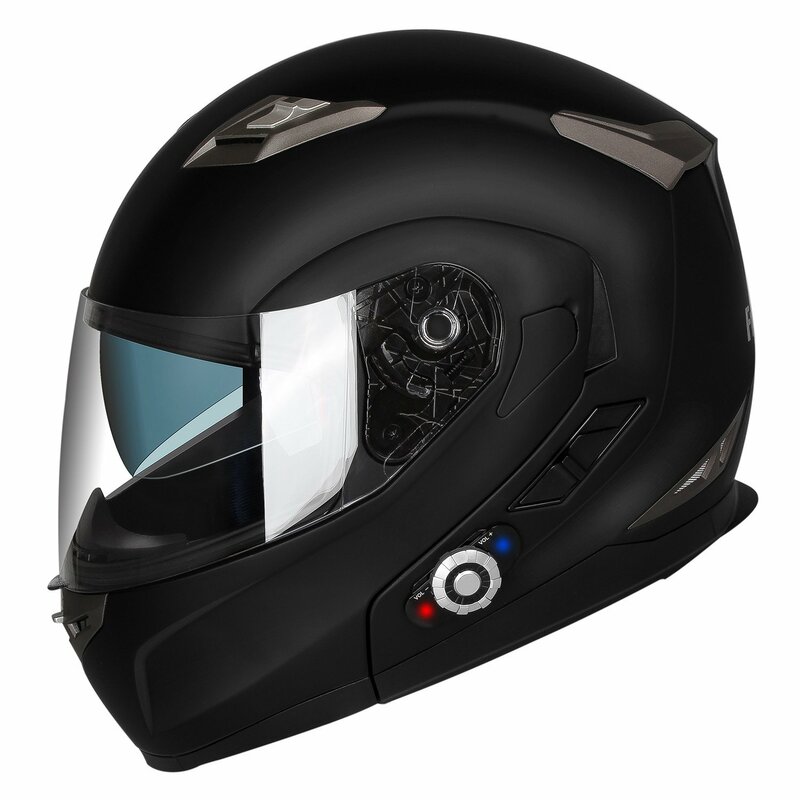 Featuring loads of features, such as Bluetooth technology, built-in speakers and an intercom, this protective full face helmet is one of the best motorcycle helmet you will find on the market. The helmet has soft inner pads that not only provide stability but comfort too. They’re completely removable and washable, which is beneficial, considering most motorbike rides tend to be hot and sweaty. The helmet also has good airflow. The advanced Bluetooth 3.0 Technology allows 8 Hours of Talk Time and 110 Hours of Standby. The feature of One Touch Control for Calling, Answering, Rejecting Incoming Calls and Redialing is a very useful feature since the rider does not have to stop riding to take the call or worse, taking out the mobile phone to answer the call. The Intercom has a maximum range of 1000 feet which is pretty impressive. This helmet is completely safe as it meets or even exceeds both ECE and DOT Safety Standards. No helmet is perfect though. There have been issues with the Bluetooth System where, if the helmet Bluetooth system hasn’t been used for a long time, the battery would enter deep sleep mode. This makes the Bluetooth mode not available. To wake the battery up, it has to be charged for about half an hour after which the Bluetooth functionality is restored and it can be used again. Are you looking for a super-safe and versatile helmet? Then look no further as this YEMA unisex helmet is undoubtedly one of the best motorcycle helmet in the market, available at a reasonable price of just under $100. Whether you are driving an ATV, scooter or a street bike, this YEMA motorcycle helmet is worth checking out. This professional grade helmet features quality features all-around. It meets or exceeds the DOT FMVSS 218 safety standards and has outstanding materials such as an aerodynamic ABS shell, multi-density EPS, reinforced chin strap and a quick release buckle. The ventilation system is fully adjustable and helps in maintaining a constant flow of air to keep the rider comfortable. The lining and pads are completely removable and washable hence, can be kept odor free and hygienic. It also comes with a sun visor system which helps in protecting the wearer from harsh sunlight. What’s more, this helmet is a woman’s motorcycle helmet as much as it is men’s since it is unisex designed. The customers have all heaped praise on this helmet and all in all, we have come to the verdict that the YEMA YM-925 is one of the best rated motorcycle helmets out there and would make for a fantastic addition in your motorcycle headgear. This helmet is a great example of a helmet with powerful communication capabilities. 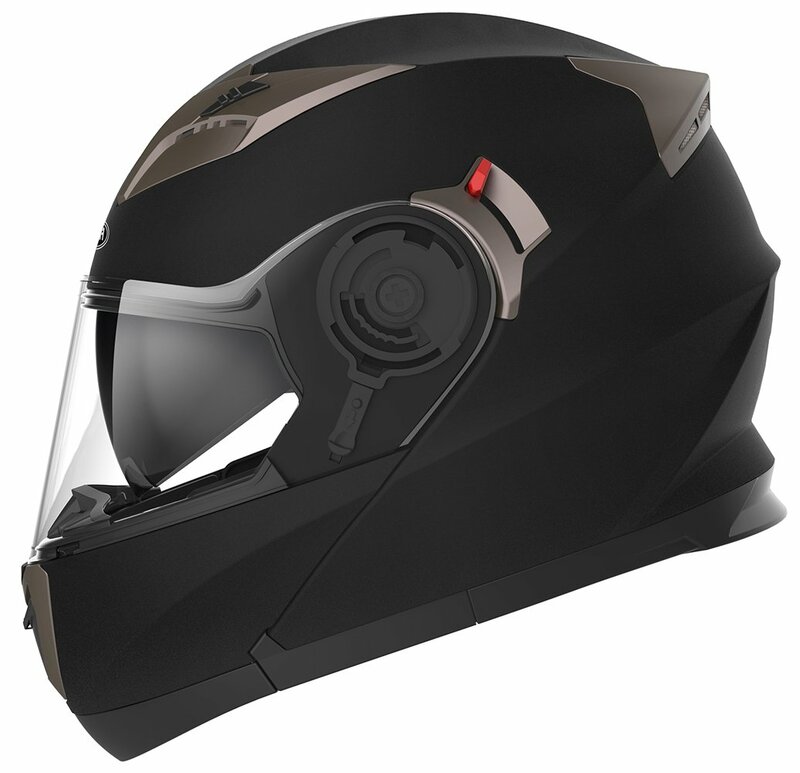 This FreedConn Bluetooth helmet features a built-in intercom system for communicating up to a range of 500m with your friends and an ABS light shell in combination with high-level ventilation to make it comfortable for the rider. Another wonderful thing is that there are cheek pads, which are removable, washable, and absorbent which makes them easy to clean. What’s more, FreedConn products are DOT and ECE certified with advanced technology making them quite attractive. The Bluetooth 3.0 technology keeps you connected with the world by allowing you to link up your cell phone, music player and even GPS easily. Users love the ‘one-button control’ that enables them to complete operations such as receiving calls or having an intercom. 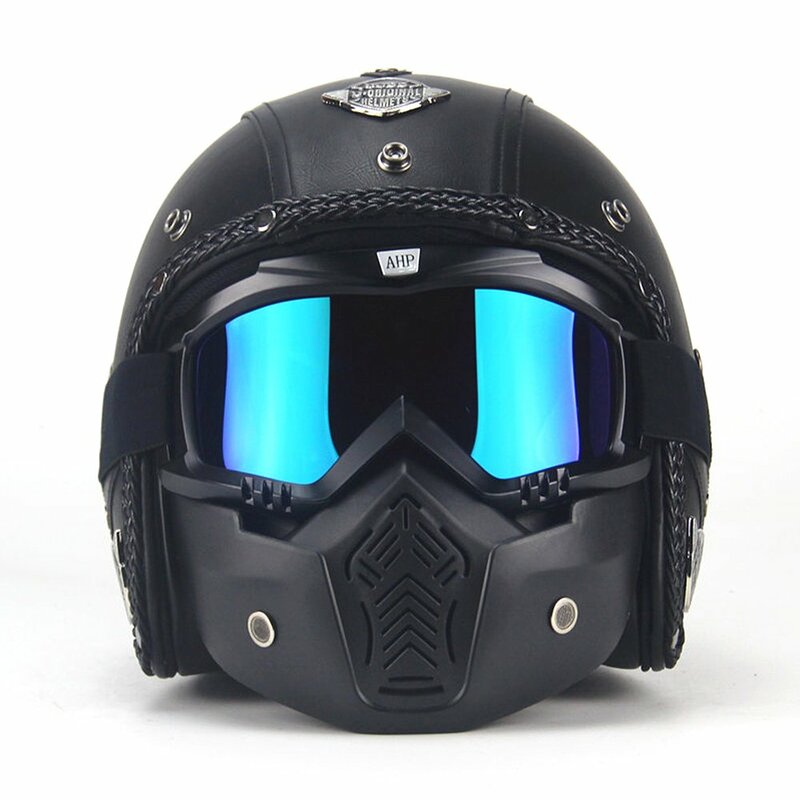 This helmet can be considered as a hybrid of half face helmet and ¾ face helmet, with the unique and radical design earning it the title of ‘badass’. The stylish looks are more than anyone can ask for. A retractable tinted drop-down sun visor has been integrated to protect you from the harsh sunlight. It comes with dark smoke installed with an additional clear visor also provided for riding during the night. The ScorpionExo consists of an advanced LG polycarbonate shell that is engineered in a way that it minimizes the weight and diffuses any impact. Other features include a removable front mask with neodymium magnets, block-off plates for use in 3/4 mode and a dual density EPS that gives the user comfort. According to one user, this helmet literally saved his life which should be reason enough for other riders to try it. ILM is one of the most recognizable motorcycle helmet brands in the market. It not only produces high-helmets but also makes them trendsetters. It is the ideal helmet for those on the lookout for a full face helmet with artistic features as well as the practicality of an open helmet. Nowadays, safety is a major factor people have started paying attention to, with everyone wanting to know the safety rating of the helmet. This helmet meets or exceeds the FMVSS-218 and DOT Safety Standards which should act as reassurance for the rider. Out of the many advanced features included, some are a High Resistance ABS outer shell, micrometrically adjustable straps, removable and washable helmet liner that makes it convenient for the user to keep the helmet clean. The anti-fog and anti-scratch visors keep the rider’s focus on the road during foggy conditions or harsh weather. The sleek and lightweight design helps in reducing the wind noise which is particularly effective while traveling at high speeds on long trips. This helmet has amassed generally positive reviews albeit of a few difficulties such as being a bit heavy on the forehead and a few screws, that hold the visors together, wobbling a bit in strong winds. 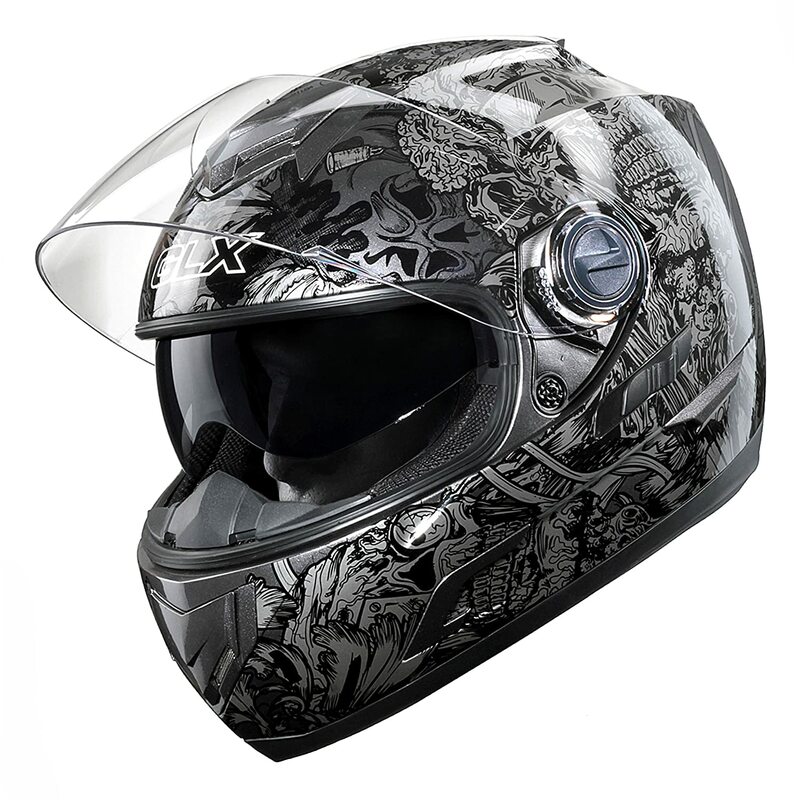 This motorcycle helmet offers a bundle of unique designs and excellent features. If your main goal is going after style without compromising on safety features, then you can never go wrong with the YEMA YM-627 Open Face Half Helmet. 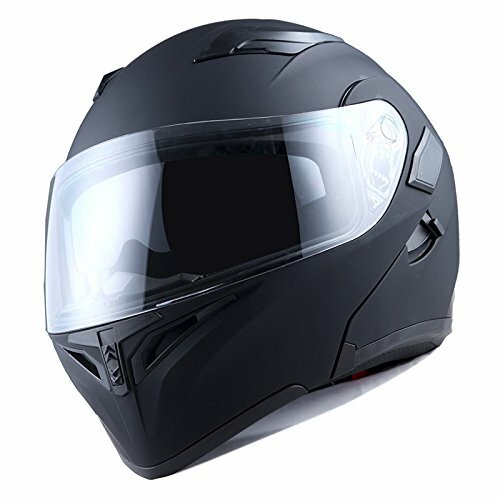 This professional grade helmet is a great choice if you plan on riding on street bikes, cruisers or even scooters. Crammed with safety attributes like an aerodynamic ABS shell, dense EPS padding, and reinforced chin strap is not found in many unisex helmets but the YEMA YM-627 has it all. There are tons of amazing features that come packed with it, with the fully adjustable vents for airflow being one of them. Aside from flaunting its cool design, this motorcycle helmet is equipped with fully removable and washable comfortable liners and pads which make the product a lot more useful to its owners in many ways. Another part of the 1Storm motorcycle helmet collection, this one is known for its sleek exterior finish. Numerous people have bought this helmet just because of the beautiful graphics engraved on the top, but we assure you that it is pretty high on safety features too. It is DOT approved and consists of an ultra light-weight, durable and aerodynamic thermoplastic alloy shell to keep you safe. 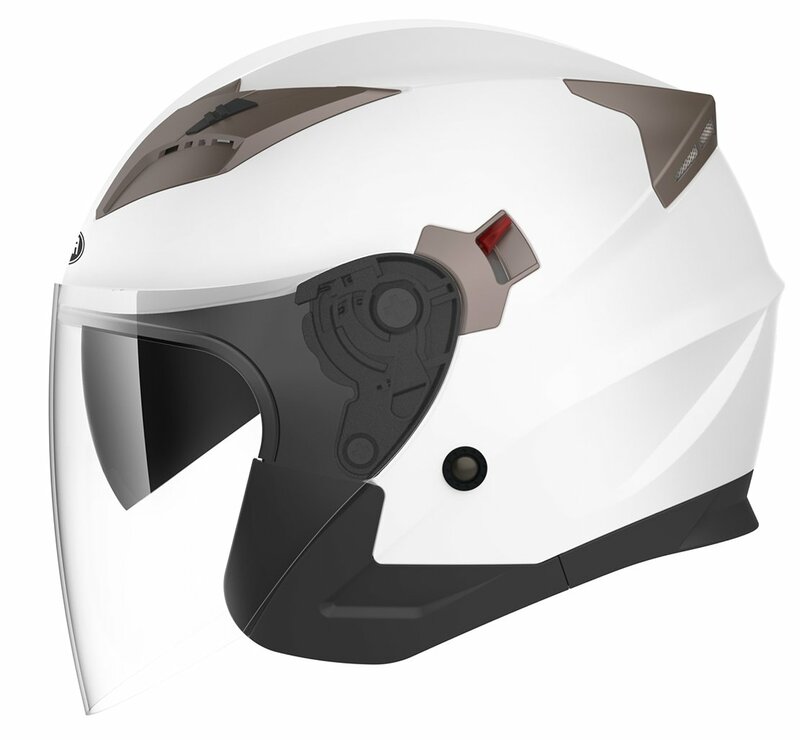 The helmet has a three-level top ventilation control and a five-position ventilation channel to provide a breath of fresh air to the rider when riding at high speeds. The ventilation system also reduces the noise from the outside which gives an enhanced riding experience to the rider, enabling them to enjoy their adventures to the fullest. The interior of the helmet is extensively packed with plush, comfortable, and heavy padding that provides maximum comfort to the rider when driving. The aerodynamic rear venturi-effect exhaust spoiler is responsible for driving the fresh air in and out of the helmet effectively. Oh, and did we mention that you get all of this for just under $55!? Duke Helmets, based in Los Angeles, under GDM, is known for providing top of the line products day in and day out. It is the safety and security of the rider that occupies Duke Helmet’s topmost priorities. These days, helmet manufacturers often gamble with safety to make the helmet more fashionable. But in the case of the GDM DK-140-MB, that is not a thing to be worried about. 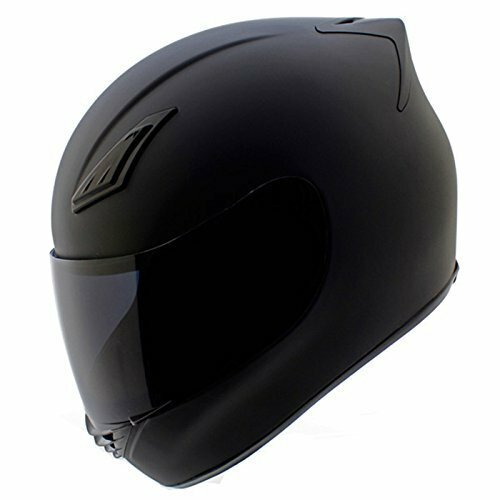 This helmet is DOT FMVSS 218 certified and consists of an aerodynamic shell reinforced with poly-alloy material which assures the rider of their security. This coupled with the fact that the helmet is tested in numerous phases goes to great lengths in indicating the quality Duke Helmets aims to provide. If you are worried about the harmful UV rays, fear not as this helmet involves an optically corrected visor. This ensures that your eyesight is not hampered. This is probably the best matte black motorcycle helmet. With the quality and the plethora of features that Duke Helmets provide, this helmet is in a class of its own. It would even be fair for us to say that this is the best motorcycle helmet brand that you can settle for. Trust us, you wouldn’t be disappointed. The Mako is the recent addition to the Torc brand. One of the best full face motorcycle helmets on the market, the Torc T14 helmet is one of a kind. It not only is highly safe and comfortable but also features a Bluetooth integrated shell that permits the rider to listen to music without buying any additional equipment. The helmet also has a maximum range of 400 meters intercom that they can use to speak with other riders. The provision of a drop-down visor helps in keeping the unrelenting sunlight away from your eyes, so you don’t lose your focus on the road. The Torc T14 is a durable helmet that provides the expected and necessary structural support. This is useful especially in the case of vivacious and extreme motorbike riders. Thanks to its Thermo Polymer Alloy Shell, which is specifically engineered to provide maximum protection, this helmet can easily disperse the impact energy in case of a crash. Equally important, the inner laser contoured liner is thick and padded, and that provides satisfaction to the rider. An added bonus is that the liner can be removed and washed in a machine, which means you can say goodbye to dirty, sweaty helmets once and for all. The drop-down visor is resistant to scratches and the flat panel shield is optically corrected. All in all, this is a great helmet that makes use of modern technology at an affordable price. The Yescom Full Face motorcycle helmet has all the basic attributes and meets the required safety standards hence has a ‘DOT approved’ label. This flip-up helmet has a heavily cushioned and plush interior that keeps the rider warm and cozy on the inside. This Yescom helmet has a unique double visors design with the usual front wide visual field clear visor accompanied by the rarer inner dark visor. The front visor is also durable, tough & highly elastic. It is also wear-resistant and impact-resistant that offers better protection in the case of a crash. The air vent is designed in a way as to allow a lot of air in for the rider to have a breath of fresh air. 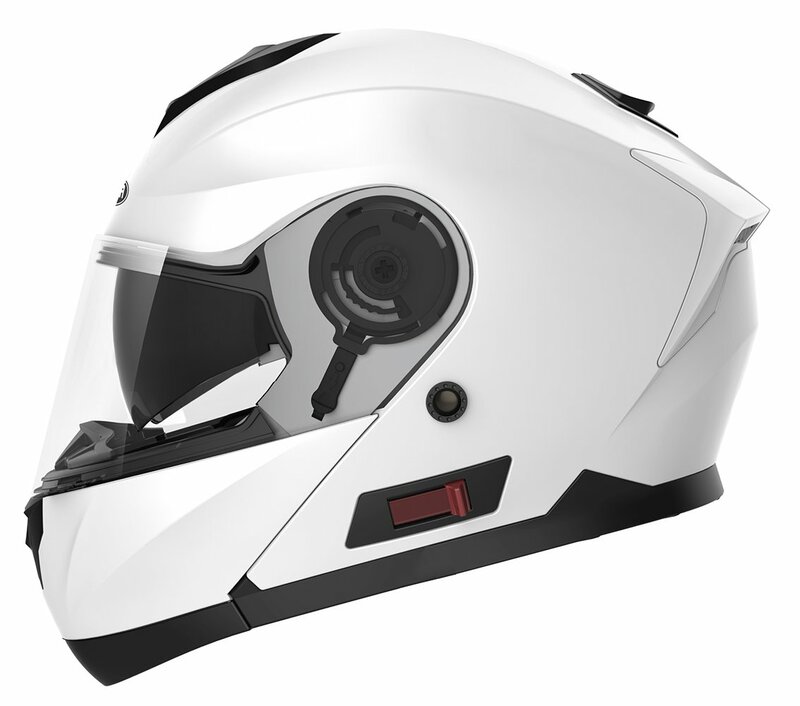 The provision of a high-quality lightweight ABS shell makes the helmet tough from the outside and also gives the rider assurance about their safety. 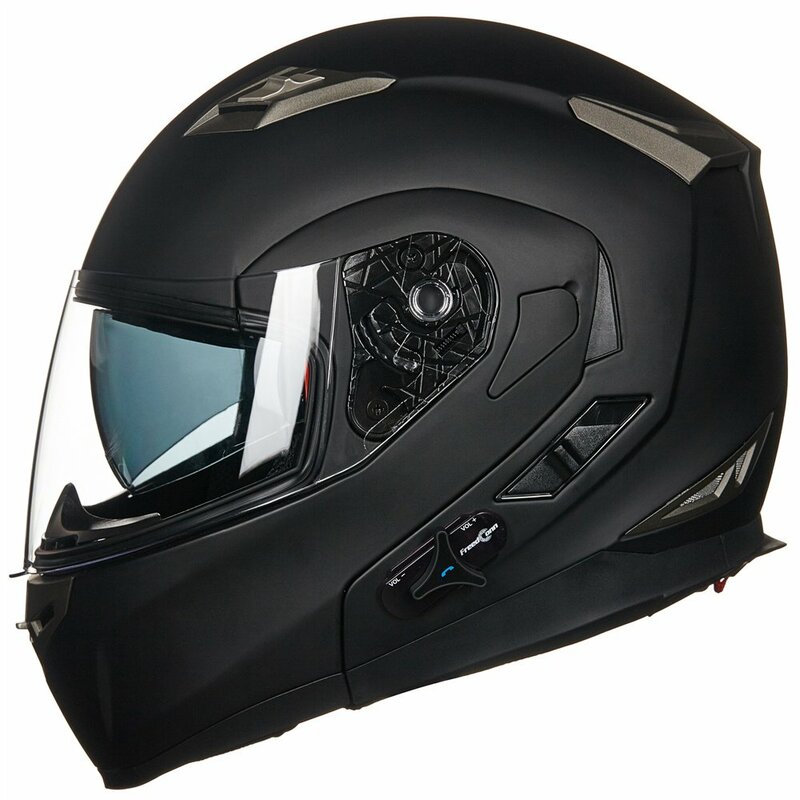 Even after all these cool features, customers have, for the most part, expressed their disapproval through ativeneg reviews about this helmet owing to the drawbacks outweighing the advantages. The YEMA YM-925 is a professional grade helmet which meets or exceeds the DOT FMVSS 218 safety ratings. This stylish helmet comes equipped with a dual visor system. It has a full-face clear visor and a half tinted visor inside to shield you from direct sunlight during the day. It is a unisex helmet that can be used for a number of things such as motorcycle riding, street biking, skiing, and snow gliding. There is a thick layer of inner lining for extra protection. What makes this helmet striking is the use of outstanding materials such as a reinforced chin strap, aerodynamic ABS shell, quick release buckle, and multi-density EPS. The helmet has two types of vents – exhaust and intake, which are fully adjustable and create a light flow of air to keep the rider cool and comfortable. Cheek pads are removable and can be machine washed so no more smelly helmets from now on. There has also been extra space given for accommodating a Bluetooth speaker and a pair of sunglasses. This NENKI helmet offers numerous features that are focused mainly on the safety and comfort of the rider. With the DOT standards met, the user can wear this helmet while driving a street bike or even a dirt bike without hesitation. Hence, the name Dual Sports Helmet. The liner and cheek pads are light and comfortable, giving the user a snug feeling when putting on the helmet. 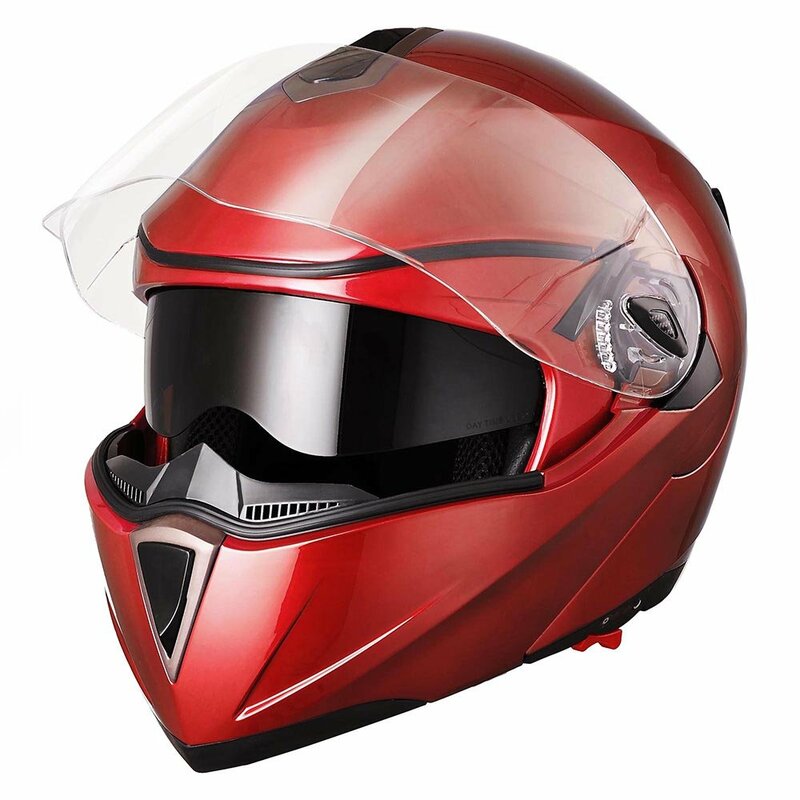 A high-quality iridium red visor and a clear visor come attached that help to keep you focused on the road, with rain or harsh sunlight not posing a problem when you wear this helmet. But after analyzing the customer reviews for this product, we found out that a putrid smelling rubber is used in the manufacturing process that makes the helmet stink. The visor also gets scratched easily which decreases the durability of the product. Full information about the working of the helmet also seems to be limited. Overall, there are better alternatives on the market that might satisfy you more. A sleek addition to the Qualifier lineup, this helmet is as stylish as they come. With the ‘Bell’ logo at the top, this motorbike helmet consists of some rather cool features. This headgear is tough, comfortable, safe and has an integrated communication system as well. 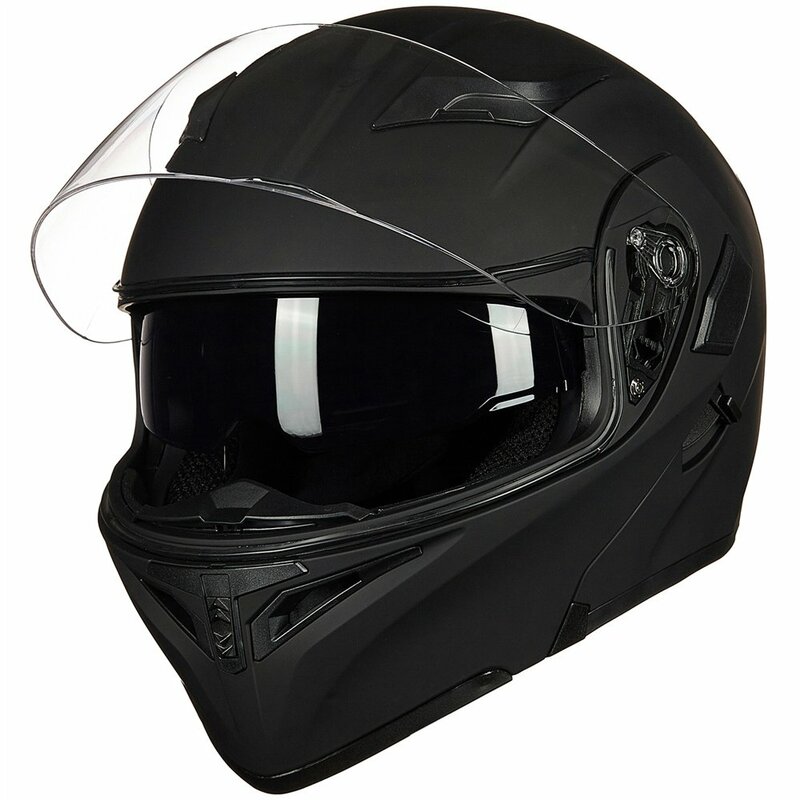 The helmet features a lightweight polycarbonate shell constructed to offer maximum protection to the biker. The interior is fully padded, including contoured cheek pads and removable and washable liner made from an anti-bacterial material. The wind collar helps to drastically reduce the wind and road noise. The Qualifier DLX also has an adjustable Velocity Flow ventilation system that ensures proper air circulation which helps cool the rider, especially during scorching hot temperatures. The NutraFog II superior anti-fog, anti-scratch, and UV protected shield is part of the package too. The Bell Qualifier DLX can also accommodate the Bell Senna SMH10 and Card Scala Rider Q1/Q3 Bluetooth stereo headset and intercom that comes handy in communicating with the outside world. The latest addition to the generation of premium and affordable motorcycle helmets, the GLX GX-15, has it all. In today’s world, it is the pinnacle of helmet performance and modern technology. This beauty is available in 6 colors which means not only are you getting a top-notch helmet, but also in a color of your own choice. How amazing does that sound! Weighing in at 3.5 pounds, the aerodynamically shaped ultra light polycarbonate shell guarantees a nice and quiet ride, giving you the feeling of owning every aspect of the road. An EPS liner in the interior of the helmet absorbs most of the impact of an accident and protects your head. It is very capable of doing that since it has met the required DOT FMVSS 218 safety standards. The GX-15 features an 18 port ventilation system with 3 level airflow channels to keep you cool even during the hottest of days. With an internal polarized sun shield attached to it, it protects your eyes from harmful UV rays and makes sure to provide you with clear vision. The removable and machine washable cheek pads are capable of dissipating sweat at a very quick pace for your comfort. A quick release strap makes all of that easy without any fuss. This helmet is the perfect blend of technology and comfort. Most of the customers are in awe of this beauty and have expressed their pleasure by means of extremely positive reviews. Thus, we can positively say that the GLX GX-15 motorcycle helmet is our pick for the best motorcycle helmet for the money. This helmet has a certain class to it since it comes with a hint of vintage. An eye-catching and cool helmet for bike enthusiasts, most popular among teens. Made of light ABS plastic and PU leather shell, it effectively reduces the impact and protects you from any kind of brain injury. A premium detachable goggle mask is provided that provides comprehensive protection to your eyes while driving. protect your eyes from the sun, wind, rain or insects. Priced just under $66, the AUTODPR Vintage helmet is totally affordable but it has obtained a few negative reviews with customers bringing into question the safety standards and durability of the helmet. This is bound to make buyers hesitant in purchasing it. Are you worried about selecting a helmet that is the right size for you? Relax, we have got you covered with our extensive guide to help you determine your head size and make the right choice. The exhilaration and thrill that comes from riding a motorcycle is something to be truly relished, but drivers often compromise their own safety while doing that. This is why the number of accidents has been on the rise, with people getting seriously injured or even worse. Therefore, riders need to wear some kind of protection to protect themselves in case of a mishap and helmets is the answer. Prevention of fatal head injuries – Protecting your head is one of the first and foremost uses of a helmet. Since motorcycle riders are normally the worst to come out of an accident, the damage could be to the head which could prove fatal. According to a report by the National Highway Traffic Safety Administration, a motorcycle rider wearing a helmet is three times less likely to die from fatal head injuries than the one without a helmet, which underlines the importance of wearing a helmet. Weather Protection – On windy days, dirt, debris, and insects could distract you and hinder your focus on the road. The visor of the helmet helps in not only keeping them away from your eyes but also reduces glare from the sun and keeps your face warm during frigid temperatures. Visibility – Due to being on the road with much bigger vehicles, motorcyclists should make sure that other drivers are aware of their presence. This can be done by using large reflective helmets during early evening and a colored headgear in the mornings. Department of Transportation (D.O.T.) – The standard is FMVSS 218, the Federal Motor Vehicle Safety Standard 218 and is applicable to all helmets sold in the US for on-road use. It is required for all the helmets to have a D.O.T. certification which is based on factors such as impact attenuation, energy absorption, penetration resistance, and retention system effectiveness. Having a standard level of protection in the above requirements makes the helmet D.O.T. certified. Customers can know this easily by spotting a D.O.T. sticker on the back of the helmet. Economic Commission for Europe (E.C.E.) – ECE22.05 is a standard level of protection that must be offered by helmets in Europe and is recognized in over 50 countries. It is, in many ways, similar to DOT, though there are slight differences between the two. These include measuring the extent of deformation when a load is applied progressively and an absence of the penetration resistance test. At least 50 sample helmets are tested in a designated government laboratory under ECE standards to verify the quality. Codes are used to specify the configurations of the helmets and whether they are approved or not. An example to denote this is – “J” is used if the helmet does not have a lower face cover, “P” denotes if the helmet has a protective lower face cover, and “NP” signifies if the helmet has a non-protective lower face cover. Snell Helmet Standard – It is a non-profit organization that offers prototype testing for manufacturers. Sample helmets are submitted to Snell, which tests them using their own standardized tests. If the helmet passes all the tests, then it is labeled as ‘Snell certified’. There is always some controversy in determining the best safety rating to consider while buying a helmet because of the differences in the rigorous nature of tests involved. The bottom line is that the helmet should, at the least, be DOT approved so it offers the basic standards of protection. All the best motorcycle helmets are at the least DOT approved. It is of paramount importance that the helmet you choose to buy is the perfect fit for you. A helmet that properly fits can play a major role in the outcome of an accident. People tend to often neglect this factor because they don’t have the right information on finding the best fitting helmet. It is important that you feel comfortable wearing the helmet because it is that one thing that goes wherever you go, possibly for several thousand miles down the road. Helmets produced by various manufacturers are usually bound to be of different sizes. Sizing varies from brand to brand, so it shouldn’t be a surprise if a medium in one brand may fit like a large in another. One can read various reviews of the manufacturers but the best understanding is obtained after trying on the helmet yourself and gauging the comfort level accordingly. Remember, having a well-fitting helmet is just as important as any helmet safety rating. A helmet that is too big or too small for your head will not be able to protect it properly. That’s why it is necessary to determine your head size to identify the best motorcycle helmet for you. We have put together 6 steps to help you with this. Start by wrapping a soft measuring tape around your head, about half an inch above the eyebrows, above your ears and around the back of your head at the largest point. It’s usually preferred to have assistance when measuring. Compare your head size with the specified motorcycle helmet size to find a good enough match. Each motorcycle helmet manufacturer provides different sizing charts for the helmets so you will need to compare your helmet size with each brand’s sizing thoroughly. Always try on the helmet before purchasing it. You should make sure that the chin strap is tight enough and there is only enough space for two fingers to fit under the strap and the chin. The helmet should be tight so that you don’t feel any gaps around your head but it shouldn’t be so tight that it makes you uncomfortable. It is better if you keep the helmet on for a few minutes and try to move it with your hands. If the helmet rotates around without any movement of your head then it is not the right fit for you. The best way to test the fit of the chin strap is by looking down towards the chest and trying to push the back of the helmet upwards. If the helmet moves, then the chin strap isn’t tight enough and you should look for other options. You should know the shape of your head so your helmet can fit snug onto it. Helmet manufacturers usually factor in three head shapes while making helmets. Long Oval – This shape is more aggressive with a longer length front-to-back than side-to-side which resembles an oblong head. The higher priced helmets geared towards competition generally fit the long oval shape best. Intermediate Oval – This shape is close to a round head, with a shorter front-to-back and a wider side-to-side. This is a typical shape for mid-range helmets. Round Oval – This head shape best suits those, whose heads have a slightly longer side-to-side than front-to-back. 1. What kind of a motorbike do I ride? Various helmets are available for different types of bikes. If you are riding a touring bike, zooming across streets, then a helmet with superior sound insulation and great air ventilation would be preferred. If you are riding a sports bike then the helmet you choose should ideally have a prominent aerodynamic design for the higher speeds. Choosing a helmet according to the type of the bike you ride does make a difference and your choice should be based accordingly. 2. What is my experience level? If you are just starting out with your first motorcycle, then it probably isn’t a wise choice to spend large amounts on a helmet. The basics including the safety offered should be considered primary as opposed to fancy features like Bluetooth speakers. This will help you ease your way into motorcycle riding and gain more experience. 3. How often are you going to be riding? If you have to commute every day from your home to work then a helmet with features such as easily changeable face shields, drop-down sun visors etc would be ideal in contrast to riding for many hours at a stretch on weekends. For this, you should seek helmets that maximize comfort and has great soundproofing. 4. What kind of conditions will I be riding my motorcycle in? If dirt and mud is your ideal place to ride a motorcycle then you should choose a helmet that maximizes performance and safety. It would be perfect if it had an aerodynamic lid and a very tough outer shell. Most people fall into the category of riding the bike to work and then tearing it up on the weekends. For this, a normal helmet with all the basics will suffice. In cold conditions, look for fog-resistant face shields which will prevent fogging up of visors and subsequent blocking of your vision. In warm weather, look out for a helmet with exceptional air ventilation that will keep you cool and in peace. How To Ensure Your Motorcycle Helmet Is Best Looking? Always follow the care instructions provided by the manufacturer since they know more about their own helmets. If you are not sure about how to approach an issue, then it is recommended that you check out their website or contact them directly. Keep the cleaning simple, using only mild soaps and not petroleum-based cleaning products since they cause a reaction with the outer shell. This weakens the structure and makes it prone to cracking over time. Keep the face shield clean and make sure to replace the face shield if, by any chance, it gets scratched. This is your main view of the world so there is no need to try to cut down on costs in this area. If the screen is scratched then you need to replace it with a new screen, period. Store your helmet in a flat, secure area where it is nowhere near gasoline or any chemicals. Replace your helmet after a crash. The EPS foam present between the comfort layer and the outer shell is meant to breakdown and collapse, while absorbing the impact and protecting your head. Even the smallest impact can compromise the integrity of a helmet shell. Most of the structural damage to a helmet is not visible to the naked eye but is contained inside the EPS (expanded polystyrene) in the form of hairline cracks or stress fractures. The EPS liner is the layer between the interior padding and the outer shell which serves the purpose of absorbing maximum impact on collision. Once this EPS layer breaks down, it is no longer able to protect your head from damage which is something you don’t want to happen. So in the event of an accident where you crash your helmet, you should replace it. The same goes for in the event of dropping the helmet. Helmet manufacturers and the Snell Foundation have reached a consensus of replacing the helmet once every five years, given no accidents occur. A helmet degrades naturally due to reasons like wear and tear, hair oils, cosmetics etc. One must understand that technology keeps improving over time which means production of more durable helmets in the future may be possible, but for the time being, 5 is the number. Our extensive product and buyers’ guide has been aimed towards providing enough information to you so that you can make the right choice and buy a motorcycle helmet that will stay with you for a long time. We understand that out of these many options, it can get perplexing as to what is the best motorcycle helmet and we have done our best to clear any confusion. After analyzing each product thoroughly, we have come to the conclusion that the GLX GX-15 Full Face Motorcycle Helmet is the best motorcycle helmet since it has all the marvelous features and satisfies the basic requirements too. 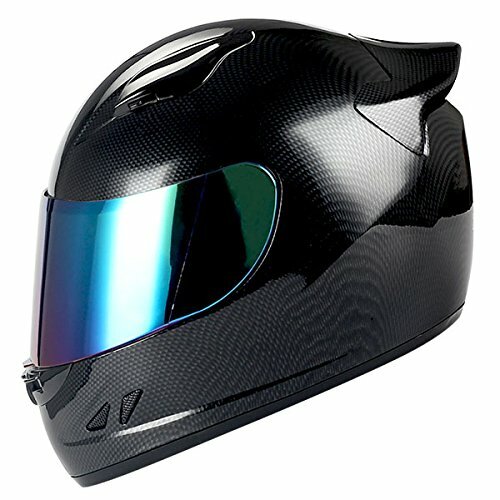 Hope this helps you in finding the best motorcycle helmet for you.